Protection of the Territory | Zapovednik "Denezhkin Kamen"
The zapovednik is a specially protected natural territory that excludes all forms of management, even general visiting (except for the needs of research or protection), in order to preserve its indigenous complexes in their untouched natural state. 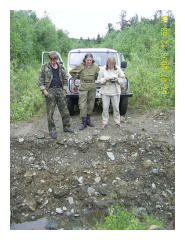 State inspectors (guards) employed by the zapovednik are responsible for keeping people out of the territory. These inspectors have wide administrative powers. The primarily task of the wardens it to prevent violations of the preserve's regime including trespassing, fishing, hunting and so forth, but they also participate in a number of research activities such as mammal and bird counts. Wardens fill out questionnaires designed by the scientific personnel and help provide data on animal and plant distribution, phenology, and disturbance events. Although currently a wide range of remote sensing is available, territory patrolling is still the only effective method of territory oversight. Thus most of the working time of the zapovednik wardens is field work. Illegal fishing is one of the most frequent regime violation. At least twice a year the zapovednik wardens are trained in different fields such as firefighting, orienteering, legislation, and others.